I still get both the New York Times and the Wall Street Journal on paper, and every morning I have the opportunity to compare their front pages, and thereby, their world views. Increasingly, it looks like the US’s two weightiest national papers are presenting fundamentally different pictures of the world to their readers. Friday offered a particularly striking contrast: Both papers led with stories about campaign finance. If you read the Times, you came away with the impression that the US Chamber of Commerce, a business lobby, was blowing out the gaskets this cycle. 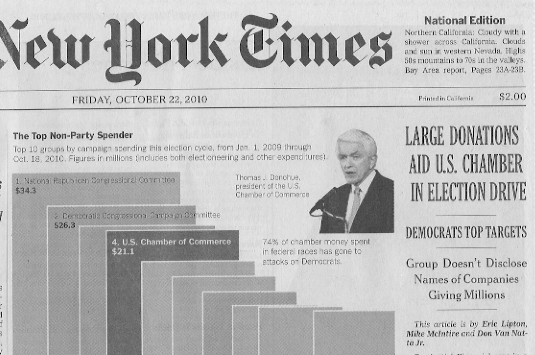 The chart accompanying the Times’ lead story identified the Chamber as “The top non-party spender” in the election, having spent $21.1 million, an amount raised largely from “a relatively small collection of big corporate donors” who have been able to remain anonymous. Meanwhile, over at the Wall Street Journal, the lead story painted a vastly different picture: “Public-Employees Union Now Leads All Groups in Independent Election Outlays,” the headline reads. “The American Federation of State, County and Municipal Employees is now the biggest outside spender of the 2010 elections,” according to the Journal, with a war chest of $87.5 million. The Times chart, by contrast, has AFSCME spending only $7.9 million. There are any number of possible explanations for this discrepancy. I’m no campaign finance expert, but I assume it has to do with different sourcing; different definitions of “outside group” and “independent” or “non-party” status; different timespans aggregated in the totals; and no doubt other factors. Observant readers will note that each paper’s version of this story neatly maps to the ideological positions their critics have assigned them. Blue-state liberals are outraged that the Supreme Court has allowed business to pour anonymous millions into this election cycle; red-state conservatives have long believed that business cash is only a necessary counterweight to the mighty electoral power of union dollars. The Times and the Journal are both playing the roles their opponents have cast them for in this partisan drama. Still: campaign spending is one of those matters of fact that we ought to be able to nail. Somebody is the biggest “outside spender” in this cycle — either it’s a union, or it’s some conservative lobby like the Chamber of Commerce. Or it’s some anonymous group. 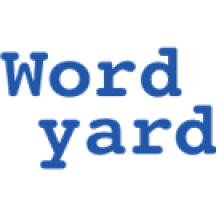 Which raises the question of how either paper can make a claim to knowing who the top outside spender is in the elections, since it seems pretty clear that astroturf groups flush with unmarked bills are flooding these elections with unprecedentedly huge sums that no one has been able even to begin to count. In order to argue about this picture with any confidence, you need data. You need to know who is spending what. And of course that is the problem with this election cycle: Thanks to the Supreme Court’s decision to overturn our already highly inadequate campaign finance rules, we voters don’t have even the most basic information about who is spending how much on the elections. You can argue that “money is speech” from now till doomsday. We aren’t anywhere close to the stage of having the important discussion of how we actually restrict this kind of spending. All we’re saying is: surely the American people have a right to know who is buying its lawmakers. Right now this demand comes from the left, but I have a feeling we might hear a little more of it from the Tea Party types after this election, when they see how effectively all that corporate cash deep-sixes their hopes of dynamiting the status quo. Even as the G.O.P. benefits from unlimited corporate campaign money, it’s pulling off the remarkable feat of persuading a large swath of anxious voters that it will lead a populist charge against the rulers of our economic pyramid — the banks, energy companies, insurance giants and other special interests underwriting its own candidates. Those candidates were bought with unmarked bills. This campaign money is now as hard to trace as the mortgage dollars that two years ago blew up the economy and that are now jamming the works of the foreclosure machine. How can you even begin to claim to have fair elections or an honest government without transparency in political spending? Why should the right to free political speech also cover the right to anonymous political speech by the million-dollar-load? Until we repair this colossal breakdown of our system, we’ll be stuck in the 2010 cycle’s banana-republic mode. All this campaign finance concern rings hollow after Obama refused public funds and spent over $750 billion.